Forget paper maps, they are so old hat. Getting around via Global Position System (GPS) has rendered the age-old map reading argument obsolete. Tall buildings and built-up areas still provide problems for GPS devices, but for the map-phobic they are still handy navigational aids. So much so, that mobile phone manufacturers are convinced that GPS enabled phones are going to be big business. After all, smart phones are getting smarter, and the ability to navigate via a device which you already carry around with you has obvious advantages. At the moment GPS functionality is reserved for more expensive handsets. But investment in GPS chips has reduced the cost to such a degree that cheaper, navigation-capable, phones will soon start appearing. But navigation via a mobile phone is just the start of story. The ability to pinpoint an individual's location provides the developers of GPS software and devices with a host of opportunities to create new location-based services. Software which relies on knowing where a user is. GPS devices already highlight points of interest like famous landmarks or motorway services, and because mobile phones can receive constant updates, information relevant to a user's exact location can appear instantly on a handset. Orem Nissim, head of GPS company Telmap says: "You should expect to see, first of all, a lot more content. "The whole thing about connected devices, like a phone that can bring in information, is not only about seeing the map but it's also about seeing the information that can be presented on top of the map, such as restaurants, coffee shops, bars," he adds. There is the potential for location based services to deliver more information than the whereabouts of the nearest coffee shop. Developers are working on social networking applications and sites like Facebook and MySpace already run cut-down versions for handsets. 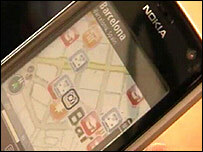 Combining social networking and GPS means users can take photos, upload and tag them on a map on the move, as well as locating friends in a network via GPS. Dan Harpel head of social networking service GyPSii says: "Social networking to date has been, from our point of view, top-down on the internet. Everybody sits at their computer and they upload stuff not on a real time basis. "What we are enabling people to do is generate user generated content with their mobile phone in real time. Eventually, as hundreds of millions people start to use these applications, you will start to see new content emerge on the internet which comes from the ground-up, on a location based vector," he adds. 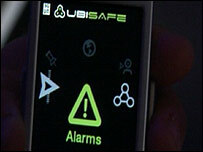 Italian developers have created Ubisafe, software which, when used in conjunction with GPS enabled phones, will allow parents to check out their children's exact location. Bunking off school could now become even more of a challenge for unruly youngsters. Truants could of course leave their mobile in school locker for the duration of the day, and mum and dad would be none the wiser. This application can also act a GPS alert service for elderly relatives. Hit the alert key on a phone and relatives or carers will be immediately contacted with the exact location of a user in distress. This location based technology does throw up the potential for annoying features however. If retailers and marketing companies could have access to a user's GPS location, targeted advertisements and updates relating to things like the nearest high street coffee shop chain could also start clogging up your phone's screen. Targeted location based advertising could indeed become an irritation. As could our friends and loved ones tracking our every movement.